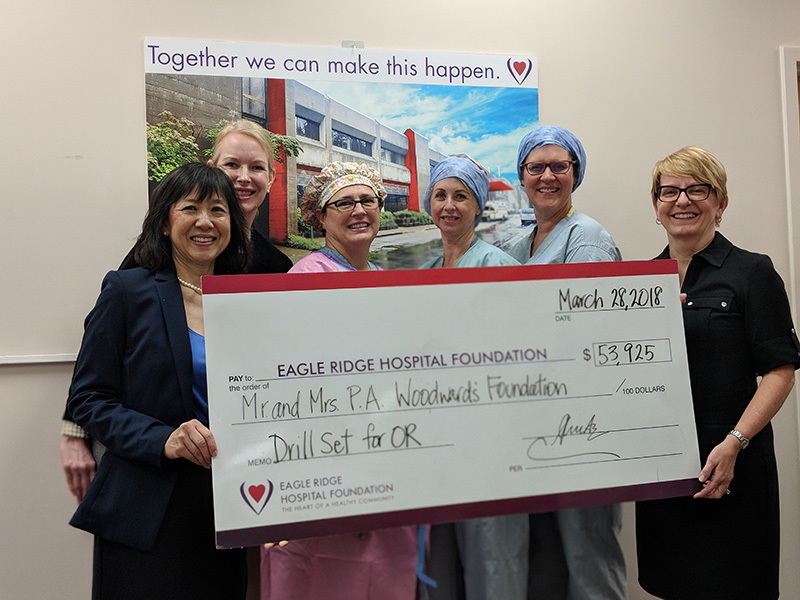 Eagle Ridge Hospital Foundation received $53,925 from the Mr. and Mrs. P.A. Woodward’s Foundation to support the acquisition of three drill sets for ENT, Spinal and Neck surgical procedures at Eagle Ridge Hospital. Attending this cheque presentation ceremony include (Left to Right), Cheryl Bosley, Director, Fund Development, Eagle Ridge Hospital Foundation, Jackie Lee-Son, Executive Director, Mr. and Mrs. P.A. Woodward’s Foundation, Laurie Purdom, Gillian Foster and Katja Hersh, OR Nursing Staff, Eagle Ridge Hospital and Charlene Giovannetti-King, Executive Director, Eagle Ridge Hospital Foundation.